It is an entrance test for admissions into MBA programs in various top B – schools and other institutes across the India, it conducted by AIMA (All India Management Association) New Delhi, 4 times (every trimester) in a year. 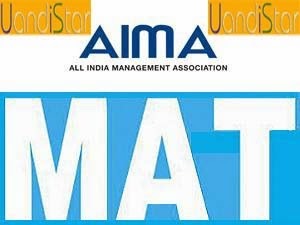 Management Aptitude Test or MAT as it popularly knows is conducted 4 times (in February, may, September & December) by the centre for Management service (CMS) a division of all India management association (AIMA). B-schools, next in the pecking order after scores. Generally, B-schools, next in the students through CAT. This is not to mention, of course the fact that many B-schools admit students through both CAT & Mat as well as certain other exams like XAT & ATMA which we will be discussing. The MAT exam generally comprises 200 questions with 4 marks for every right answer and 1 mark deducted for every wrong answer. The various areas which generally have 40 questions each are as follows. As you must have noticed vis-à-vis CAT, MAT has an additional section of General Awareness which the student needs to master. Also since some time now, Mat can be attempted either as a pencil-and-paper test or in the more recent avatar of a computer based test (CBT). Educational Qualification: Applicant should be graduate (10+3) in any stream (arts / science / engineering / commerce/ architecture) from a recognized university or its equivalent. Also students appearing in their final year of graduation can also apply for MAT but they are required to produce the passing proof later. There are no minimum percentage criteria for qualifying exam, all students who have passed graduation successfully can apply for MAT. General English Language and Comprehension.